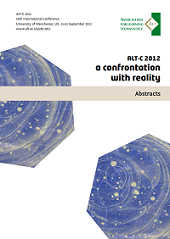 For more information about altc 2013 please go to the dedicated conference pages. For more information about ALT-C2012 please go to the dedicated conference pages. For more information about ALT-C 2011, please go to the dedicated conference pages. For more information about ALT-C 2010, please go to the dedicated conference pages. For more information about ALT-C 2009, please go to the dedicated conference pages.